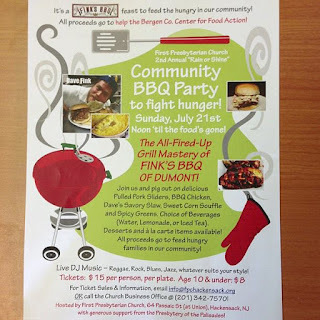 On Sunday, July 21st, the First Presbyterian Church (64 Passaic St.) will be hosting their second annual community barbecue to fight hunger. Tickets are $15, and $10 for children under 10. All proceeds will benefit the Center for Food Action. 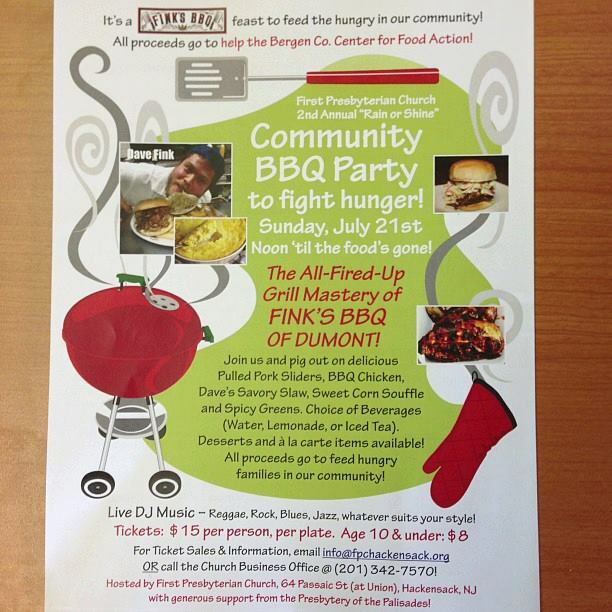 The event will be catered by Fink's Barbecue of Dumont, rated 4 of 5 stars on Yelp. The barbecue boasts all you can eat Pulled Pork Sliders, BBQ Chicken, Dave's Savory Slaw, Sweet Corn Souffle, and Spicy Greens. There will be dessert served and a la carte items available. For more information email info@FPChackensack.org or call 201-342-7570. 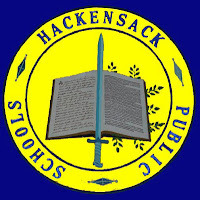 The Hackensack Scoop has already purchased tickets and I look forward to seeing you all there! 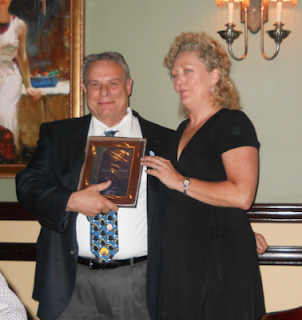 The Hackensack Rotary held its annual scholarship luncheon at Rudy’s Restaurant on Thursday, June 13, 2013. Nineteen scholarship awards totaling $20,000 were presented. 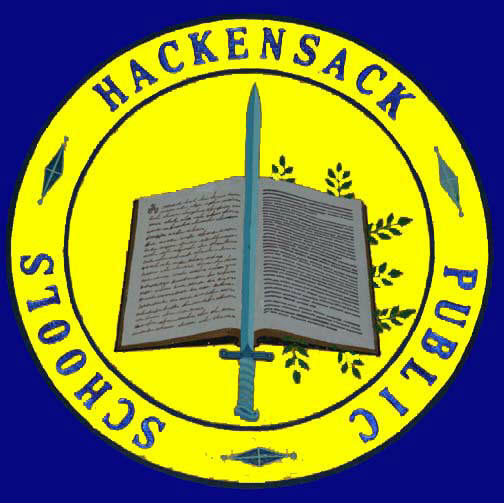 Hackensack Rotary scholarships are made available to graduating seniors who are residents of Hackensack. Scholarships are also presented to children of Hackensack firefighters from a special fund created after the tragic loss of five Hackensack firefighters in the Ford Dealership fire on July 1, 1988. Scholarship recipients: Jonathan Avila, Briana Browne, Tiarra Cavallo, Jelani Fearon, Timothy Fisher, Gregory Flintall, Morgan Johnson, Mary Kubler, Kayla Ligon, Chelsea-ann Mckenzie, Jeremy Olivo, Yanhire Sierra, Rhonyelle Sowell, Tiffany Chandler, Lauren Goodridge, Harry Mongondato and Kayla Freeman. Not picture are Nicholas Stahl and Christopher Kalman. Christopher Kalman is the son of Deputy Fire Chief Stephen Kalman and is currently completing a four year tour of duty with the United States Marines including a deployment in Afghanistan . The Joseph M. Sanzari Children's Hospital at HackensackUMC has been ranked 29th in the nation for Neurology and Neurosurgery by U.S. News and World Report's 2013-2014 Best Children's Hospitals rankings. This is the first time a New Jersey children's hospital has been ranked for a specialty. These rankings were built from lengthy clinical surveys and extensive reputational surveys sent to pediatric specialists and subspecialists. There were 179 hospitals surveyed for this ranking, 110 of which provided enough information to be considered for ranking in one or more specialty. The report, click here to view, applauds the hospital's commitment to clinical research, improvement, advancement of technology, and patient advocacy. At the annual installation dinner, the Club President, awards the Rotarian of the Year Award. The criteria for the award is as follows. The Rotarian of the year is a loyal, dedicated, Rotarian as demonstrated by his/her level of attendance and participation and their acceptance of responsible positions at the Club and District level. They support Rotary Foundations at the local and international level. They live a life that exemplifies the Rotary motto of "Service Above Self." Finally, they strive to live the 4-Way Test in their personal and professional life. Congratulations to this year's Rotarian of the Year, Richard Gelber. For those of you who are unaware, or do not remember, last spring the "Zisa/Hurwitz" faction of the Board of Education, due to Trustee Mark Stein's conflict of interest, lacked the votes necessary to renew three administrators' contracts. After no less than three failed votes to renew the administrators' contracts, the Zisa/Hurwitz faction all became suddenly conflicted and the Board invoked the doctrine of necessity. With Stein now able to vote yes, the three contracts were renewed. Though I whole heartedly supported the renewal of Principal James Montesano, I as a resident did question the method in which the Board authorized the renewal of the three administrators' contracts. I also questioned Patricia Aquino Lozano's fitness for the position of Vice Principal based on morality. I addressed my concerns at Board of Education meetings, and through a letter. Despite her contract renewal, Aquino Lozano filed a lawsuit in Federal Court alleging that Board Trustee Carol Martinez retaliated against her for her political affiliation with the Zisa family. Aquino Lozano also alleged that Martinez, by using information that was improperly obtained from her employee file to petition to the State Board of Examiners, deprived her of her right to privacy. US District Court Judge William Martini heard a motion to dismiss Aquino Lozano's case. He granted that motion and ruled in favor of Defendant Martinez. Martini noted that Aquino Lozano "failed to set forth sufficient facts" to support her claims that Martinez retaliated against her based on political affiliation, deprived her of her civil rights, or that she suffered any adverse employment action. Martini declined the right to rule over the State claims for a deprivation of civil rights or rights to privacy, he did however dismiss the case in it's entirety without prejudice. In an itemized budget, Allied World Assurance Company projected a $200,825 cost for the defense of Carol Martinez in this action. Though the total cost thus far is not yet identified by The Scoop, the itemized budget shows that pretrial costs including a dispositive motion (which was granted) were projected to total $57,075. According to a Trustee of the Board, who declined to be identified, the Board was responsible for $10,000 of these costs. Despite Judge Martini's noting a lack of evidence, Aquino Lozano refiled her case in State Court. The legal meter just continues to tick. Trustee Martinez declined to comment as litigation is still pending, she did however say that it was sad that tax payer money was being wasted on unnecessary litigation. Aquino Lozano referred her attorney Louis Zayas for comment, a call to his office was unanswered and his mailbox was full.